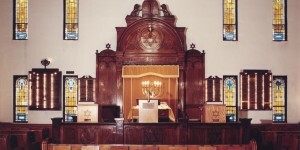 The Homestead Jewish community began to form in 1893 when there were more than ten men who wanted High Holiday services in town; it recognized the end was near in 1991 when fewer than ten men planned to attend High Holidays services there. 1 For years the community had been making a minyan only by driving in Russian immigrants, but the bigger issue was that the building needed a new furnace, new glass, a new paint job, and worst of all, a new roof. If they waited much longer to sell, the building would have fallen into such disrepair that it would have been unsalable. 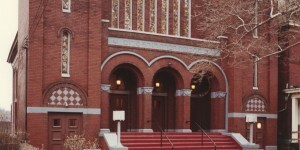 The building was put up for sale sometime in 1992 and purchased in January 1993 by a church, and thus the synagogue ceased to be. 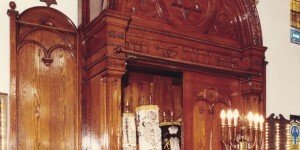 Just before the building changed hands, photographs of its interior were taken by a professional photographer hired by the Rauh Jewish Archives. It’s a good thing, too. When I first visited the synagogue in 2010, long after it had been converted to a church, I could tell that most of it was as it had always been; however, it was clear that the front area, where the bima and aron used to be, had been significantly altered (pun mostly intended). But how? I was thrilled to discover these photographs in the archives to see how the most important part of the synagogue had once looked. The remainder of this post are those photographs, with one exception from the personal album of Clarice and Bob Katz. 2 Please click on the first photograph to enter the slideshow. My explanations are below each picture; you may need to scroll down to read everything. In this follow-up post you can see pictures of how the building now looks as a church. As viewed from the women’s balcony. 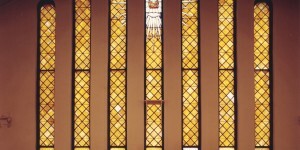 Note the stained glass windows lining the side wall. Below many you what looks like streaks from water that leaked through. 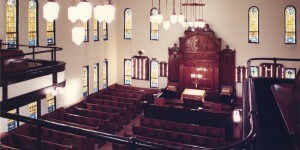 Note the yahrzeit tablets symmetrically arranged, alternating with the stained glass windows. 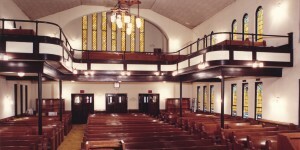 As viewed from the bimah at the front looking back towards the entrance. At the corners of the ceiling you can see additional evidence of water damage. 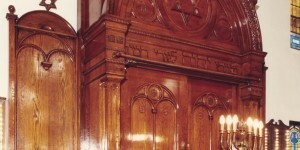 It is believed that the aron kodesh was made in Europe. 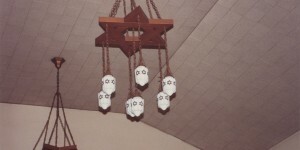 It was carefully removed from the synagogue before it was handed over to the church and installed in Beth Shalom in Squirrel Hill, Pittsburgh. The verse translates to, “I have set the Lord always before me” (Psalms 16:8). Unfortunately a major fire in October 1996 destroyed the ark. 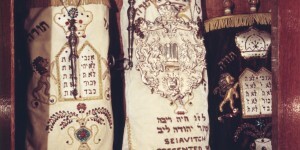 These Torah scrolls were also donated to Beth Shalom. After the fire the remains were buried in the Homestead Hebrew Cemetery in accordance with Jewish law. 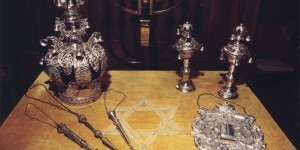 Counter-clockwise from bottom-right: The hoshen (breastplate), rimonin (finials), keter (crown), and yadayim (pointers). They were also donated to Beth Shalom, and I believe that they did not survive the fire, either. 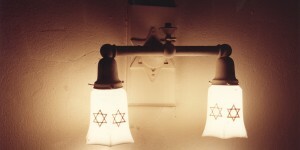 This lamp is one of many lining the walls of the sanctuary. 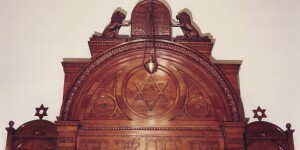 Do the close up photos of the Yahrzeit plaques still exist somewhere? I would like to see any from my family. Yes, those photographs do exist! I’ll do a follow-up post with them soon.